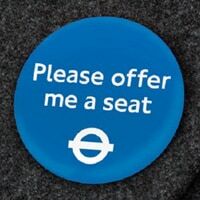 You can get a free ‘Offer Me A Seat Badge' from TFL which will be useful to let other people know that you need a seat. This badge will be helpful for people who are disabled or ill and need to have a seat. Click on “GET IT HERE” button and then fill up the form on next page to get your free badge from TFL.